When purchasing real property in New Jersey, it is highly recommended that you purchase an owner’s title insurance policy because it is the only thing that will protect your investment against claims that could result in a lawsuit. When you purchase real estate, a deed is provided to you by the seller. You would think it’s safe to assume that there was an accurate conveyance of title, but this isn’t always the case. 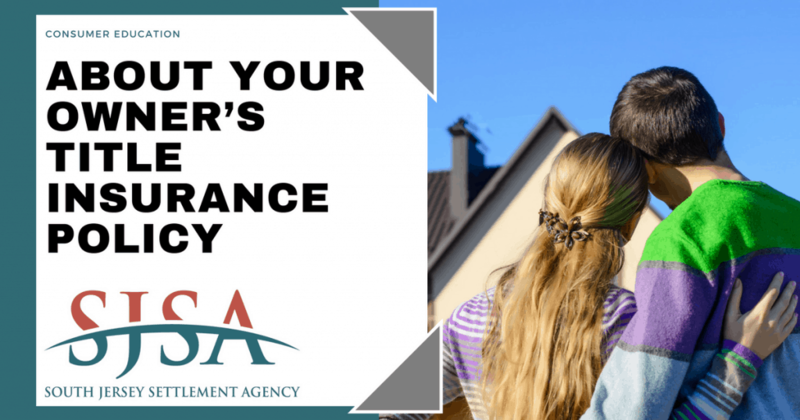 Your owner’s policy will protect and defend you if someone later down the road tries to sue you because they claim to have an interest in the property. If you opt out of purchasing title insurance, you will have no recourse but to lawyer-up. And not only could this deplete all of your assets, but you could also lose your most valuable asset, your home! Never take chances on what could be the single most expensive investment of your life. Common claims come from a previous owner’s failure to pay for obligations that can and will attach to the property should they find out a deed transfer took place (such as municipal items and superior court judgments). What’s even worse is discovering that the person who sold you the property had falsely claimed to be the rightful owner. Your owner’s policy will protect you against false impersonation of the true owner of the property, as well as forgery and fraud. Situations like this happen more than we care to admit and, quite frankly, are a few of the good reasons title insurance exists. Suppose the previous owner took out a second mortgage or a HELOC prior to closing that had not yet been recorded. Oh my goodness, that lender’s lien would trump your deed! Fortunately, your owner’s policy protects you against things that are unforeseen, such as unrecorded instruments. Another common hidden risk is when the record owner is deceased, and the executor or administrator of the estate believes that they had the right to sell; but yet that was not the case. Worse yet, what if you spent years and all your hard earned money fixing the property just the way you want it and then a rightful heir comes forward to claim what you believe belongs to you? This scenario happens more often than you would think. Only your owner’s policy will protect you against misinterpretation of wills, unpaid inheritance taxes, and undisclosed or missing heirs. Again, without a policy, you would need to lawyer-up which could devastate you and your family! Quite honestly, there are a whole slew of reasons you should purchase an owner’s title insurance policy. We encourage buyers to err on the side of caution any time they are considering purchasing real estate without obtaining an owner’s title insurance policy. It’s important to know and always remember that title insurance exists so that you have defense should any hazard arise after you take possession of a property. When you have an owner’s policy, you are protected against an attack of title and your title insurance company will defend you, perfect the title, or pay the valid claim. Contact SJSA at 856.690.1121 for additional questions you may have.